Join Deep Sea for the adventure of a lifetime diving the magnificent Outer Great Barrier Reef. With daily departures available, they can offer the certified diver a flexible diving itinerary. They are able to have daily departures by using a transfer vessel which takes divers to the main vessel which is permanently moored at the reef. Deep Sea Divers Den has a number of permanent private moorings at selected dive sites such as Norman Reef , Saxon Reef , Jorgies, Breaking Patches, and Hastings Reef. The choice of sites depends on the wind, tidal currents and visibility. Each dive site is distinctly different and offers an excellent opportunity to observe the spectacular coral formations and exotic marine life for which the Great Barrier Reef is so famous. 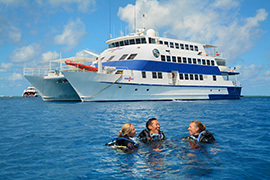 This is a most popular trip with the opportunity to have 7 dives. A favourite with most divers is Troppo Lounge. It was named for a large sand patch adjacent to the mooring. There is a coral wall at the northern edge of this site starting at a depth of 16 feet and dropping to 90. The wall has a number of interesting crevices and is ideally suited for swim throughs. The wall is loaded with both stony corals and colourful soft corals, as well as lobster and several morays. Divers are likely to spot white-tipped Reef Sharks. Nearby is another mooring marking the location of Caves Mooring. This site is great for divers who love exploring the nooks and crannies of a complex coral reef structure. It is loaded with a large number of caves, arches, crevices and small tunnels. The most impressive is a cave that has a seven foot wide entrance beginning in 45 feet of water. The tunnel exits onto the reef at a depth of 26 feet. This site is a favourite haunt for turtles, a school of Pacific Barracuda, a Bull Ray and, on occasion, a Manta Ray. The Mountain is another favourite dive site named for a massive coral head that begins at 60 feet and rises to within 10 feet of the surface. The boat mooring is adjacent to the coral formation, marking a sandy patch in 32 feet of water. Just in front of the mountain is a small farm containing a variety of Tridacna Clams of various sizes and colours. The largest is a giant Tridacna with a three foot long shell. The sandy patch is a favourite hangout for stingrays and sometimes, a turtle. This is just a small sample of the numerous dive sites along the outer edge of the Great Barrier Reef. Other sites offer an opportunity to see a diverse selection of coral formations, fish and invertebrate marine life. This company strongly advise considering clients to pre-book as availability may be limited if you wait until your arrival to Cairns. If you can also advise of your accommodation at time of booking a pick up time will be given.